Washing a suit after use is best done by hanging it upside down and spraying it with a hose pipe. If there were any leaks during your dive then spray up the inside too. Be careful not to blast a jet of water into your dump valve from the outside as you could damage it but do flush the dump valve with water from the inside to the outside. If necessary dirt or rust marks can be scrubbed off with a bit of hand washing powder and a brush. Soap powder should not affect the seals or fabric but be sure to rinse it all off anyway. We find that all suit fabrics benefit from an occasional good soak in fabric conditioner. After washing the suit hang it to dry in a shady well ventilated spot. Tri-lam suits dry in about an hour but neoprene suits need much longer as the neoprene is absorbent. Once the outside is dry turn the whole suit inside out as far as it will go and dry the inside. Divers often assume that the inside of their suit is dry but that is hardly ever the case. Just about all suits need to be dried on the inside after every dive. The inside of most drysuit rubber boots are neoprene which takes a very long time to dry unless you turn them inside-out as far as they can go. See our video on the “Read this First” page on how to do this. Once a suit is 100% dry inside and outside and the seals have been well powdered it should be rolled up and stored in it’s bag. Some divers like to leave their suits hanging up to keep them ventilated and dry but we don’t recommend this as the suit is then exposed to more air which contains ozone that eats latex seals. Ozone may be found in high concentrations near florescent lights and some electric appliances so keep the suit far away from these. Neoprene dries out and shrinks over many years of storage so keeping a suit as air tight as possible in storage should prolong it’s life. Light, specifically the UV component of light, and contact with copper or copper containing alloys should be avoided. Contact with chemicals and solvents would be disastrous. CLEAN, COOL, DRY and DARK. Store your suit with the zip open to relieve the pressure on the sealing membranes but be aware that the zip is more vulnerable to bending when it’s open so you may want to keep it closed for short periods of storage and definitely for transportation. 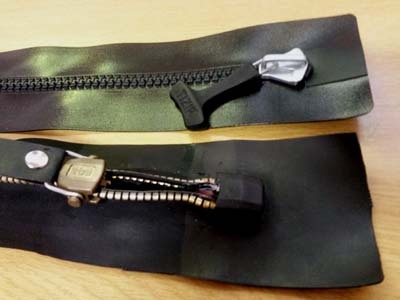 Zips often fail because of wear caused by excessive bending at the point which is on the inside of the slider when it’s against its stopper with the zip fully open. To distribute the wear and prolong the life of the zip try to open the zip to a few centimetre short of the stopper. It will then stop at a slightly different spot every time and the wear will be distributed. Suits with zips across the front of the suit (self donning), suits with the zip in a bib (Typhoon CnK Tech) and suits with normal shoulder zips are all folded/rolled up differently. In each case the objective is to keep the zip from being able to bend excessively. Shoulder Zip Suits Lay the suit down front-up with the arms extended. Place the boots together and roll it up from the boots to the shoulders. Fold the arms in over the rolled up body with the zip on the outside of the roll. Front Zip Suits Lay the suit down front-down with the arms extended. Fold the arms onto the body straight in or slightly angled towards the crotch. Place the boots together and roll it up from the boots to the shoulders. Bib Zip Suits Lay the suit down front-down with the arms extended. Fold the arms onto the body straight in or slightly angled towards the crotch. Place the boots together and roll it up from the boots to the shoulders. Fold the ends of the bib in over the rolled up body. And finally, never leave your suit in your car in the sun while to go for your post-dive lunch. We all know how hot it gets inside a car in the sun. An hour at 50°C is going to potentially melt latex seals and re-activate all the adhesive which is keeping it watertight. Latex and silicon neck seals and conical shaped cuff seals (not the bottle shaped ones) are made so that the fit can be loosened by cutting rings off. Never try and stretch a latex or silicon seal to make it bigger. Trimming rings is not that difficult but be sure to use a very sharp pair of scissors and cut narrow rings (approx 6mm) off one at a time, checking the tightness after each cut. Trim the edges straight as the seal may tear if the edge is irregular. Latex stretches with use so as long as the seals are not going to strangle you on the first few dives with new seals you will find them becoming more comfortable with regular use. Unscented talc powder is the best preservative for latex and you should never leave seals for more than a day without being completely covered in a layer of it. Talc forms a very thin barrier between the seal and the air which protects the seal. It also allows seals to slide over skin easily so they are far less likely to be damaged when donning or removing a drysuit. One can use baby powder (scented talc) to make donning a suit easier but don’t use it for storage as the scent chemical may attack the latex. The best way of powdering seals without making a mess or wasting talc is to use a sock to control and spread the talc by knocking it against the seals. Apply the talc above the little bucket that it comes in so that excess falls into the bucket. Small tears or latex degradation (gooey/sticky/black/ooze) on the edge of a seal can be fixed by just trimming that part of the seal away with a neat curved cut. Neoprene seals are popular in applications where a hard-wearing and longer-lasting seal is required. They certainly do last longer than latex seals but unfortunately they hardly ever seal as well as latex or silicon seals and you may have to live with small leaks caused by water running along the seams. Neoprene seals don’t need to be covered in talc during storage but a bit of powder will help to make donning the suit easier. Even though neoprene seals last quite long (expect about 5 to 10 years) you should still keep them out of the sun and look after them because replacing them is far more costly than with latex or silicon seals. The fit can be adjusted as follows: To make a seal bigger if it is too tight it needs to be stretched overnight on a bottle or bowl. Be careful to do this a little at a time as it is quite easily over-stretched. To make a seal tighter if it is too loose you will need to bring it in so that we can remove a strip of neoprene and re-glue the seam. It is a quick job and fairly inexpensive but it requires the right glue and skill so don’t try it at home. Aquaseal is great stuff and we use it all the time for leak repairs and small sealing or filling jobs. It’s very sticky and can be used to adhere 2 surfaces together although that is really more appropriately done with a neoprene or polyurethane contact adhesive. Using Aquaseal without the addition of it’s accelerant (Cotol) can be tricky as it runs away before it hardens which makes repairs look terrible. Inflate the suit with the neck seal plugged by a plastic ball or container (don’t stretch it too much) and the cuff seals plugged with plastic bottles. You can inflate it with a scuba cylinder via the inflation valve but an air mattress pump connected via one of the seal plugs is more effective and you can’t accidentally burst you suit like you might do with high pressure air. Water with dish washing soap sprayed or poured over the suit will reveal most leaks. Be aware that some small leaks only allow flow in one direction (outside to inside) and when you test the suit normally you are looking for inside to outside flow. So one-way leaks will not show unless you use the same method with the whole suit inside-out. Its sometimes difficult to find exactly where a seam leak starts when testing a suit on the outside as the air runs along the middle of the seam and comes out quite far from where it went in. This is another case where testing the suit inside-out is better. Anyway, the fact is that small leaks can be very hard to find so if you don’t succeed at home just get the suit to us – We don’t charge for testing, only for the subsequent repair. Small punctures and tears on the suit fabric can be repaired at home but seam leaks should get professional attention. The glue in bicycle puncture repair kits is neoprene contact adhesive so that or a blob of Aquaseal are great for small DIY repairs. Always repair leaks on the inside of the suit. When using contact adhesive you should roughen-up the surfaces to be glued with sand paper and clean them with a solvent before applying the adhesive. Drysuit valves that are working correctly don’t need any maintenance other than being rinsed when the suit is washed. Dump valves that are leaking or not working properly have most likely got some dirt stuck inside and will need to be cleaned. 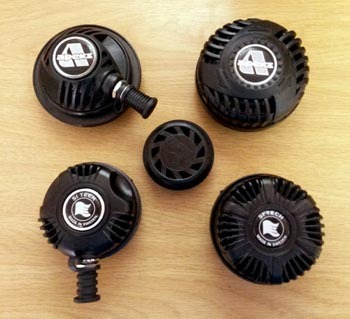 The small automatic cuff dumps (centre) can be opened and cleaned easily but do not attempt to open a variable dump valve (right top and bottom) yourself. If you can get a problematic variable dump valve off the suit then it’s easy to clean but if it has been glued in place (not recommended) just soak it in warm soapy water with that part of the suit also in the water. Rinse it out with a gentle hose pipe water stream from the inside to the outside. Inflation valves (left top and bottom) may become sticky if the mechanism gets dirty. This can lead to run-away inflation underwater so it must be rectified. You can try and squirt a bit of silicon oil into it but if that doesn’t work then the valve will need to be removed, disassembled and serviced. You can do this job yourself as it simply involves removing a C-clip at the back of the valve and pushing out the piston shaft which holds 2 O rings. Clean the parts with a weak acid solution and lubricate the shaft and O rings with silicon before re-assembly. Apeks swivel inflation valves (top left) can also leak water into the suit if the 2 swivel O rings become dry or dirty. Getting to those O rings requires a special tool to release a plastic barrel. Don’t try doing it yourself. Valves (except for P-valves) should not be permanently fixed onto suits with sealants or adhesives. They only require silicon grease between the backing rubber disc (which is glued on to the outside of the suit) and the valve itself to seal. Doing it this way means that you will always be able to remove the valve easily if it develops a leak and needs attention. The basics of zip care are generic to metal and plastic zips: Always open and close zips by pulling the slide STRAIGHT along the chain and keeping the sides as close together as possible. Don’t try and open or close your shoulder zip yourself if you are in your suit. During slider movement, if you feel there is more resistance, STOP, move it back a bit and investigate the reason for the jam. Don’t force it as this may damage the teeth which will mean replacing the whole zip. Watch out for sand getting into the zip if it sticks to the zip lubrication. We see a lot of zips fail because undergarment folds got stuck in the zip when closing it. Some suits have a zip cover flap on the inside which you should completely cut away if you find it wants to get stuck in the zip. There really isn’t much point to covers on the inside. Covers on the outside may be useful on metal zips where they may prevent the edges of the fabric of the zip fraying as your dive equipment rubs over the zip. For metal zips we recommend “Zip Tech” but there are several good zip lubricants available. Bees wax or paraffin wax is often used but we find it to be too hard and it may clog up zips or even damage them if hard bits get stuck between the inner elements. Liquid lubricants are OK but they don’t stay put very long and a paste lubricant like Zip Tech is much better. Always apply the lubricant to the outer teeth only with the ZIP CLOSED. The inside sealing surface around the inner elements can be treated with a thin layer of light silicon grease to improve the seal but this is seldom necessary. Metal zips suffer from fraying of the edges of the fabric and those loose fibers should be cut off and the edge singed with a lighter flame. Do that before you lubricate the zip as you might set fire to the suit if you do it after applying a paraffin based lubricant! Metal zip outer teeth can also be cleaned if the zip is getting hard to slide. This is done by rubbing it with a solvent wet cloth on the outside with the zip closed. 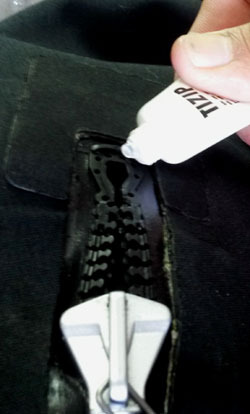 Plastic zips are only lubricated at the docking end and a special fluid paste from the supplier of the zip should be used. A leaking zip can hardly ever be repaired. Carefully examine the sealing surface around the inner elements on both sides for damage to the material itself or signs that the inner elements are not holding together. If you find a problem here it probably means replacing the zip so contact us and your bank manager immediately. If you have a drysuit with a long curved zip like those on Whites/Aqualung Fusion suits and old Poseidon self-donning suits then please take note: Curved zips would need to be specially imported if we needed to replaced one. It would be very expensive so you should look after it very well so that it lasts for the life of the suit. Please let us know if you found this info useful or if you think we should add or edit anything.